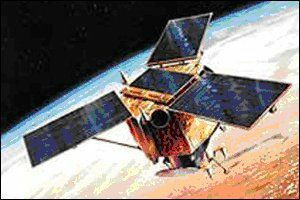 Ikonos was an American observation satellite weighing around 700 kg built by Lockheed Martin. After a first failed launch of the first satellite, Ikonos 1, on 29 April 1999, Ikonos 2 was put into orbit on 24 September 1999. This satellite takes very high resolution photographs, of urban areas for example. The Ikonos 2 satellite orbits at a mean altitude of 681 km, in a quasi polar circular orbit with an inclination of 98.1° (for heliosynchronism). The period of revolution is 98 min. These orbital characteristics make it possible for images to be obtained with complete coverage between the 81° northern and southern parallels. The on-board instrumentation is designed to take high resolution images. The radiometer is used to obtain images covering an 11 km * 11 km field of observation with a spatial resolution of 1 m in panchromatic mode and 4 m in multispectral mode. However, given the narrowness of the field, any particular point on the Earth's surface is only flown over every 35 days, but the sensor can be redirected, allowing this period to be reduced to 3 days if necessary.